The road was good to me! Sonoma gave me some breathing room. I really didn't expect Tru-Jr-Fan to lose this one. So with Gordon taking first, my team winning against Super_D, and Tru-Jr-Fan dropping one - I can say the road course was very good to me. Things are really tightening up! Next race I will for sure go 12-4. So, no matter what happens with the other guys, I will maintain the lead. It was neat seeing Gordon win again. He complained about the car all race long, but he still threw it around those curves and once the final pit stops ended... you knew he was going to take it. Tomorrow NASCAR visits the first road course of the year. Who knows what will happen. Kurt Busch starts up front - which is not really something you would expect. Jeff Gordon starts off 11 - something else you don't expect. Sure hope things don't end like they start! Several weeks ago when the Greenville Grrrowl were about to close up shop, Ralph Bristol (the local radio host) joked that what the Bi Lo Arena needed was indoor NASCAR. Of course, he didn't know that something like this actually did exist. I popped him an email with a link to the Arena Racing USA web site. It made for an interesting topic on his show that day. The response was tongue in cheek, but with a tad bit of seriousness as well. Everybody chuckled, but most everyone also figured it would fly if someone actually gave it a chance here in Greenville. Well, guess what? Arena Racing is expanding and big name in NASCAR is investing. Joe Gibbs has announced that he will be helping to bring Arena Racing to Charlotte. They should be firing up the engines in November of this year. Hockey is not dead in Greenville. I don't think we would ever see Arena Racing in this city -- indoor racing is not the image that the people pulling the strings want for us. I guess we'll have to outgrow our complex about ourselves before we'll be willing to give it a try. Racing on a hockey rink - I'll take it! Well, Gordon didn't blow it for me. I'll tell you, the reason why I came out of this by a hair is that had Stewart not gotten put in the wall by Jeff Green, it could have been much closer. My drivers did not live up to their potential today. Tru-Jr-Fan had it made because he was up against the give me team. RYR28 led for the majority of the day again Super_D, but at the end he lost out. I thought I had BBuck beat good after Stewart's wreck, but then Martin started fading and Stewart picked up some spots once he got back on the track. Had the rain not stopped the race, things could have been much different. Oh yeah, Gordon could have finished the race in 9th or 8th place in the standings but he started doing his normal activity of starting out strong and then really messing up his car causing him to fade, fade, fade... Now he remains outside the top ten. Gordon has gone and messed things up for me again. I certainly didn't expect him to qualify in second and then run up near the front in a couple of the practices. Here is who I go against during the race tomorrow. BBuck will give me a run for my money. I actually think I am the underdog tomorrow. PaitRacing drivers qualified: Gordon 2, Johnson 4, Martin 8, and Shrub 15. 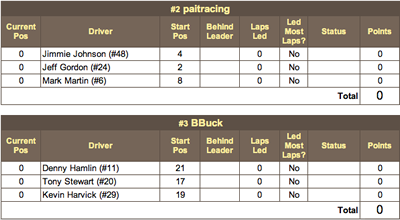 BBuck drivers qualified: Stewart 17, Harvick 19, and Hamlin 24. Okay, okay, Kyle Busch sits and I'll run Gordon again. Maybe tomorrow he will make a come back. I do wonder though how he will do after the hard hit he took last week. Nascar.com says he is feeling fine. I guess we'll find out when they start racing. Finally, I am able to connect blogger to my server and made some updates. I'm not sure what the problem has been, but I have not been able to upload updates for Vespatude.com and Stackofstuff.net. Things started connecting again this afternoon. This evening was spent with the family at the Greenville Drive game. Unfortunately, our guys lost 6 to 3. It was still great fun and the fireworks were exciting for the kids. Here the kids enjoy their hotdogs. They also loaded up on nachos and candy... I hope they sleep tonight! Here is one of the bright spots of the night. Here a Drive player hit a towering shot over the Mini-Green Monster. Sorry I missed the fireworks. All you guys get is the smoke. The stadium is beautiful and will continue to get better and better as things build up around it. If you are a Red Sox fan, you'll love this minature duplicate of Fenway. Go Drive! Oh, it was also fun to sit and watch NASCAR Cup qualifying on my iPaq using the wireless signal within the stadium. Sweet! More like Wall - Oh No! The bad news? I got beat. The good news? So, did Tru-Jr-Fan. The field is tightening up. I'm now 9/4. Tru-Jr-Fan, BBuck, and Super_D are all 8/5. What a change from back when I was running away from everyone. Of course, it makes it more interesting when most everyone has a chance. I was listening to the radio getting ready to go into church when Gordon went into the wall. I didn't get to see it until I got home. Man! I don't know what hurts more, hitting the wall or falling out of the top 10. I just don't know if he's got it in him to climb back up. I know there are plenty of races left, but the 24 team just hasn't shown the ability to adjust with the track. Even without the wreck, he was close to falling into 10th in the standings. Next week it is on to Michigan where I face BBuck. He now has three drivers in the top 10. He is going to be a force to be reckoned with. I'm going to think seriously about sitting Gordon and moving Shrub up. Statistically, that would be the better choice. Hope its not Poke - Oh No! Today the Cup guys head to Pocono. I'm hoping I'll come out of the race at least maintaining my lead. Tru-Jr-Fan is going to be hard to beat today. BBuck might be able to pull it off, but everything will have to fall just right. Tru-Jr-Fan has an average starting spot today of 7th. BBuck rolls off the grid with the average of 10th. A lot will depend on how Tony Stewart does (driver for BBuck). As for my guys, I have an average starting place of 12th. Once again I am left to wonder if I should run Kyle Busch instead of Mark Martin (starting in 20th). Kyle has let me down when I've run him in the past, but has done pretty well at other times when I haven't... I still think I will stay with my primary three. Unless he wrecks, Martin isn't going to finish in 20th! My competition this week is RYR28DAVEYSLEGACY - a Robert Yates fan. Unfortunately, he has had to drop his RYR drivers (except for Elliot Sadler) in order to be competitive. He had made some good changes and can be dangerous - though it will be hard to pull off a championship. His drivers roll off today in 8th. Wow, Brian Vickers and Jeff Burton scare me! Hopefully the talk of Vickers leaving Hendrick will throw those guys off their game. Check back later for more details. YOU might even want to help me out. This week in Pocono will be interesting. It is a track known for engine and transmission failures. I have to be somewhat confident though. All four of my drivers finished in the top 10 of last year's June race. Here's hoping for a repeat! Well, I thought Jimmie Johnson was going to be the one to let me down. Turns out I should have benched Jeff Gordon and run Shrub. Had I done so, I wouldn't have lost the race by 8 points. Yep, Tru-Jr-Fan beat me by 8 points. With only 30 laps or so left, I was leading the race. Then when the final pit stop rolled around, Gordon and Martin pitted and everything went south. I said it was going to be a close one and I wasn't wrong. However, I never thought that it would end that way after Gordon led for 80 plus laps earlier in the race. Gordon is slipping as he finished his 450th start today. He and the Dupont team just aren't what they used to be. You can tell by listening to the scanner that they can't get done what they need. They took a loose car that was starting to come to them and turned it into a mess. The slipping carries over to the points standing where Gordon is about to slide right out of the top ten. It seems that Jimmie Johnson is beginning to run the way Gordon used to race. I can remember that feeling that no matter what was happening at the beginning of a race that Gordon would be in the mix at the end. Now, there is no doubt you have to say the mantle has been passed at Hendrick from the 24 to the 48. Frankly, I'm not a big fan of the "new" Gordon anyway. I have been following him since his rookie season and I'll keep doing so, but it isn't quite the same. I really find myself pulling for Mark Martin to do well in this his last full season. Still, after today, I can't see Jimmie Johnson not landing his first championship. Today I go up against Tru-Jr-Fan. That means I have to race against Kasey Kahne, Dale Earnhardt, Jr., and Greg Biffle. Good news for me is that my drivers have tended to do better on the Dover track. However, I have a decision to make. Kyle Busch has finished 2nd in the last two races at the Monster Mile. Do I sit one Gordon, Martin or Johnson in order to run him? No, I'm going to go with my main three. Gordon rolls off in third, Martin is sixth, Busch is back in the field in thirtieth, and Johnson starts in forty-second because of this incredible spin during qualifying. So, I would say I shouldn't cout Johnson out when Busch is far back in the field as well. Last time I ran "the Shrub" I got burned. As for my competition, they come to the starting line in 11th (Earnhardt), 20th (Biffle), and 26th (Kahne). Still, just like you can't count out Johnson (who is next to last), you're not going to see these guys finish as far back as they started. They are just too good for that. Unless there are wrecks or mechanical issues for these drivers, it is going to be a close one today! Let's go racin'! 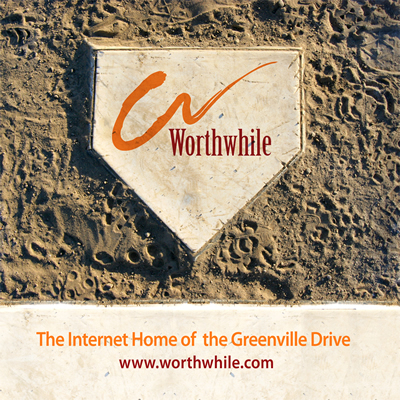 Well, the Greenville Drive have come to town and they are in the midst of their first season. I'll be one of the first to say that I was curious to see how things would go there at West End Field. I guess the jury is still out, but initial responses look pretty good. I'll admit I am more tempted by the new stadium and its location more that I was when the Greenville edition of baseball played on Mauldin Road. Hopefully you will soon see the above sign somewhere out around the field. The Worthwhile Company will be advertising in the stadium. I think the sign is pretty cool. It is kind of neat to be a part of the Drive. The team - or is it just the experience of downtown baseball - has really been accepted in the city. I was just downtown last night with the kids. We parked at the Worthwhile office and walked down to Marble Slab. From there we continued down to Falls Park. Hundreds of people were walking the streets or eating in one of the many places to eat. It really reminded me of Europe - especially when you got down to the river area. It brought to mind a touch of Lucerne. The addition of the stadium has just added to this atmosphere. While the Municipal Stadium made baseball a destination, West End Field just seems to be a part of a larger environment. Go to a game and get bored? Just walk out the gate and find something else to do. Again, I think the jury is still out. Could the good attendence just be from curious people and it will soon die down? We'll have to see, but I will have to admit that I hope the Drive succeed - unlike the Growl who died this past week.